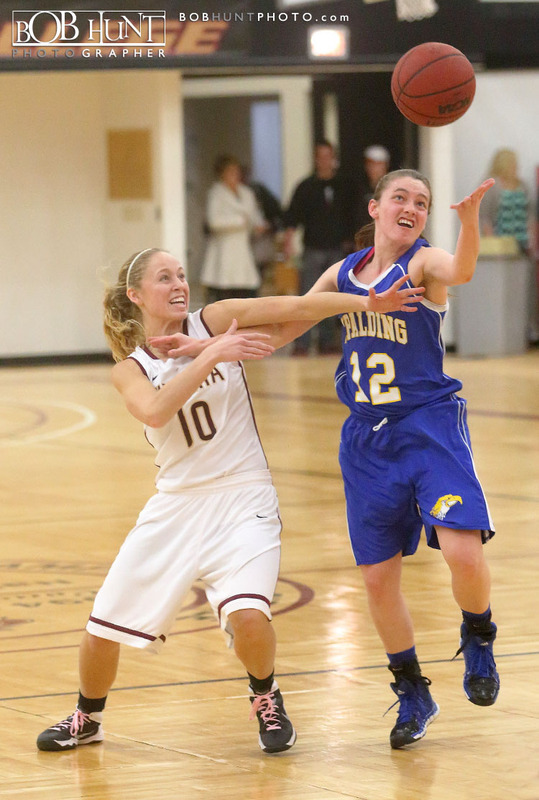 Spalding University opened up an early lead during Saturday’s St. Louis Intercollegiate Athletic Conference contest against the Eureka College women’s basketball team at the Reagan Center, holding off repeated rallies from the Red Devils in a 73-64 league victory, Saturday afternoon. 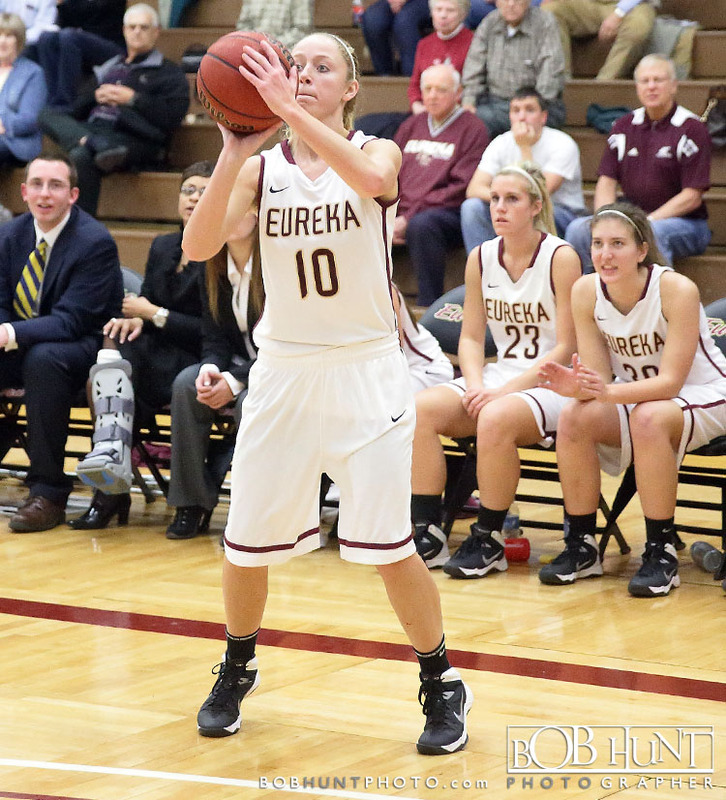 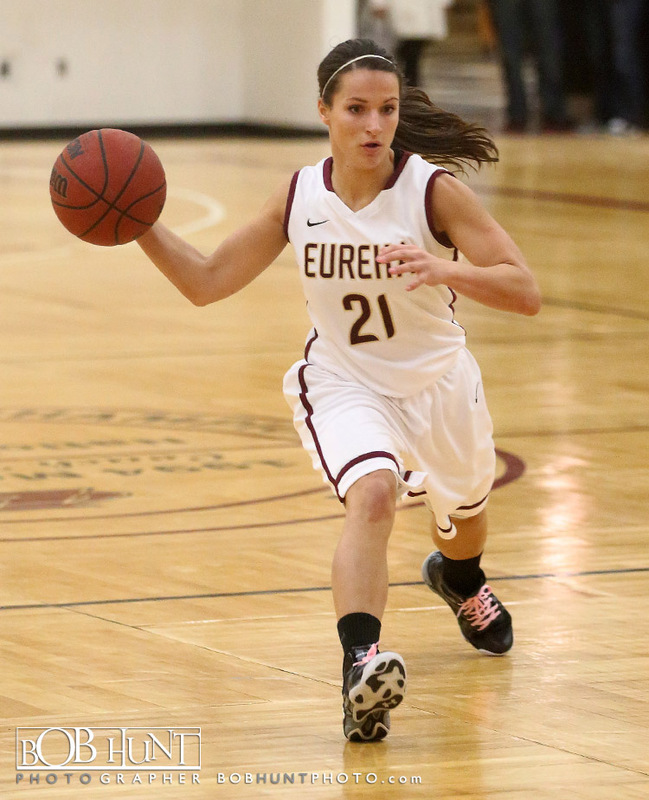 Eureka sophomore guard Emily Camden scored a career-high 19 points in the loss. 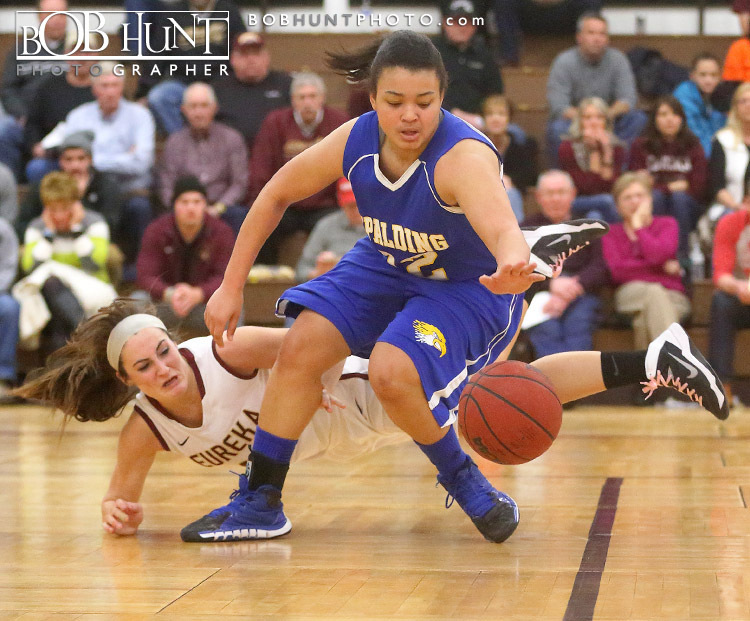 Spalding led for all but 17 seconds of Saturay’s game, scoring on its first possession of the afternoon and eventually extending its cushion to double digits on Kerstin Hayes’ layup for a 19-9 lead with 9:53 left before halftime. 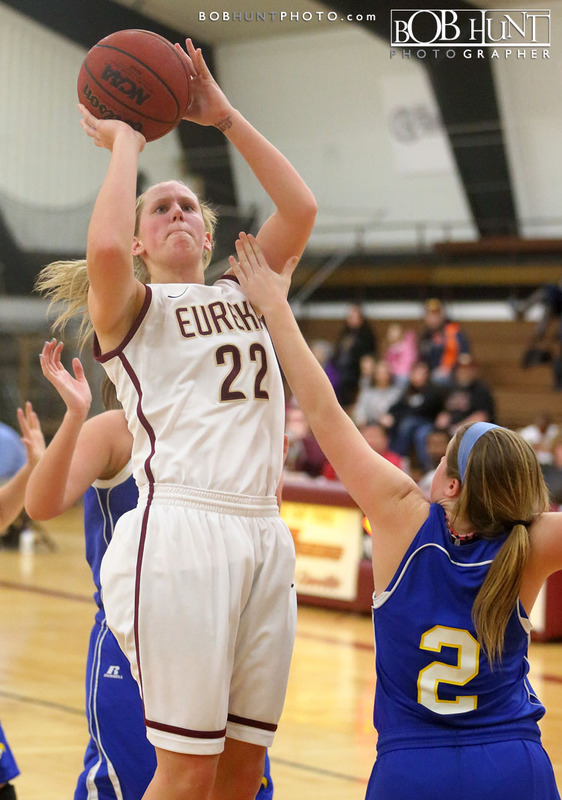 Eureka answered with an 8-0 run, anchored by back-to-back triples from Camden. 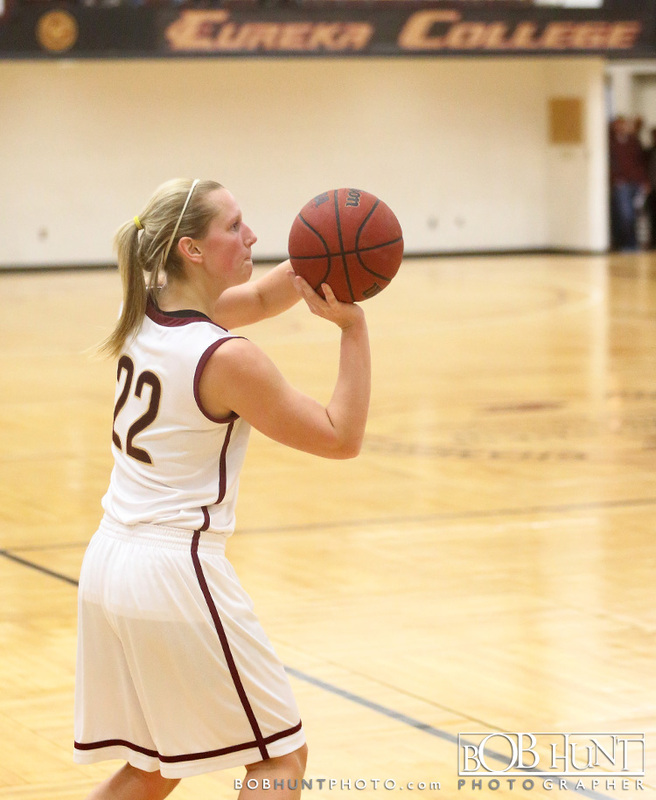 The Golden Eagles lead eventually dwindled to a single point, 25-24, but the visitors closed the first period on a 10-0 run over the final 2:55 of the the frame to lead 35-24 at intermission. 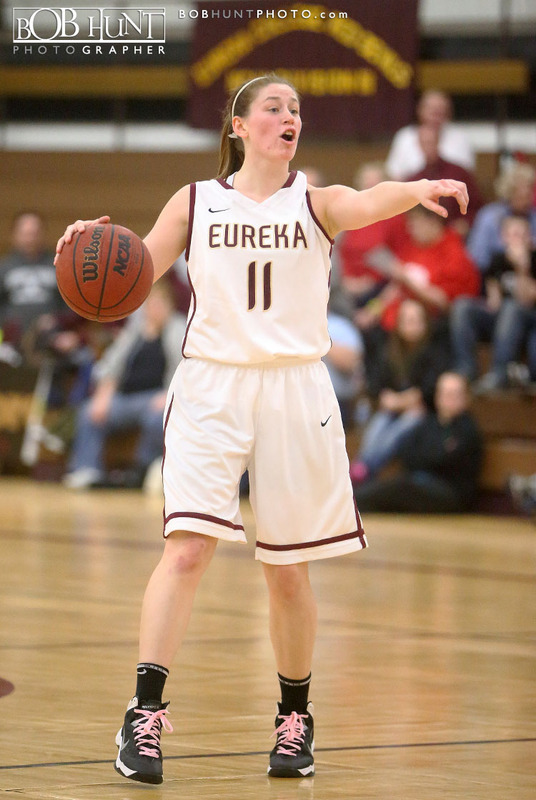 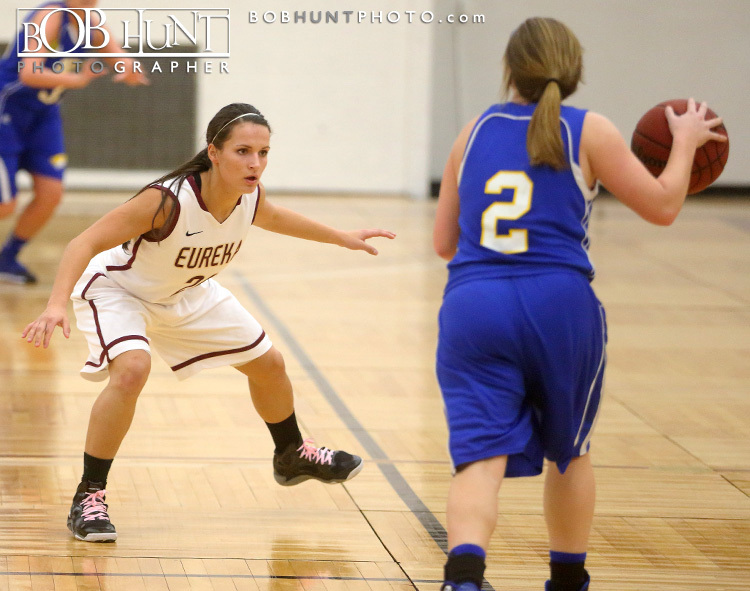 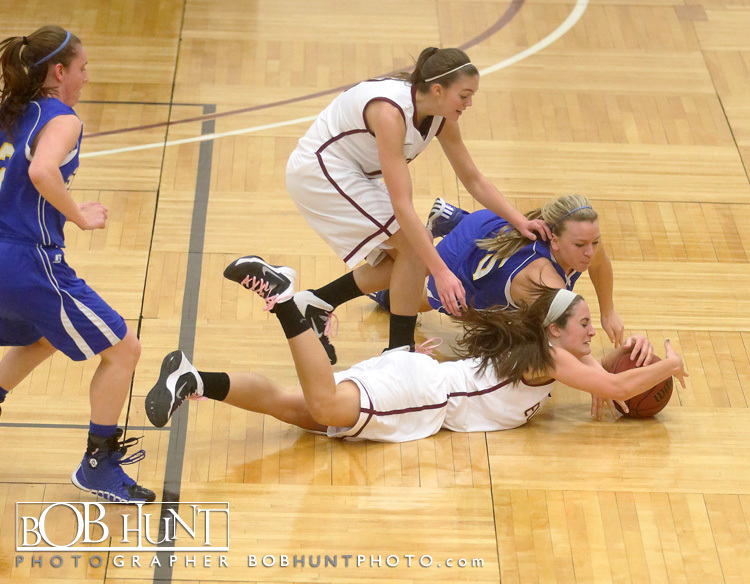 Eureka trimmed the deficit back to four, 40-36, on a layup from senior guard Caty Eeten at the 15:11 mark. 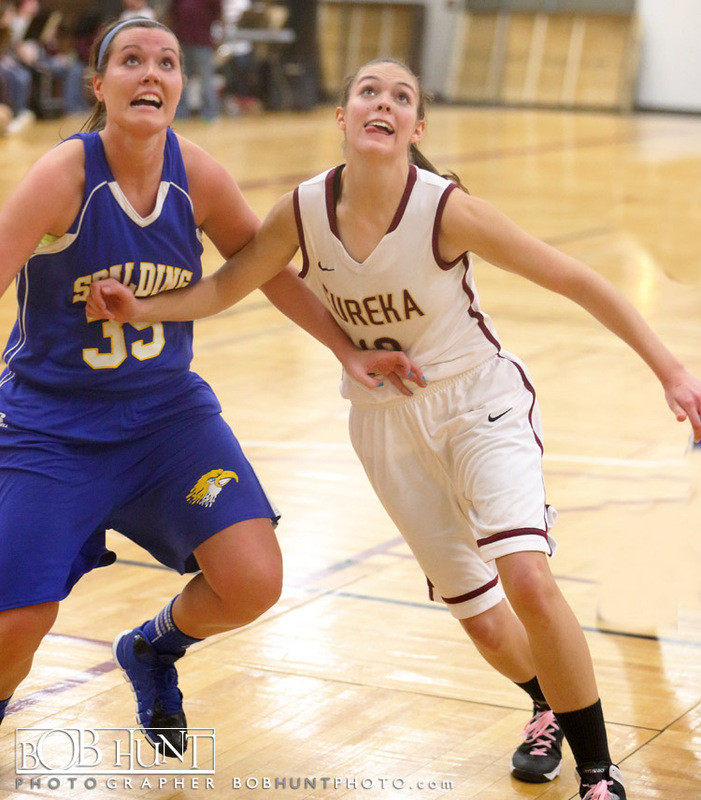 Spalding regained a 10-point cushion less than two minutes later and ultimately led by as many as 16 on Hannah Washle’s free throws for a 59-43 lead with 7:51 to play. 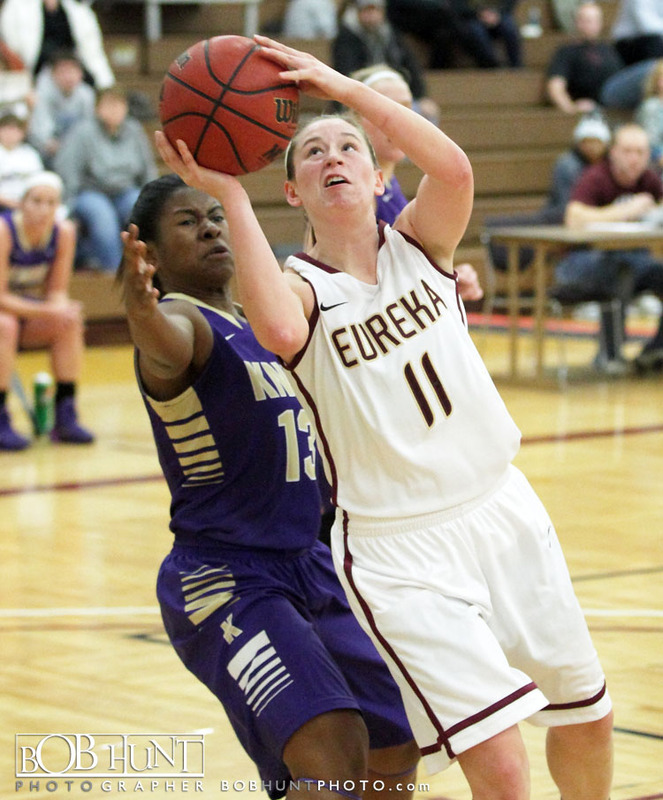 Eeten led all scorers with 21 points and added 10 rebounds for her fourth double-double of the season. 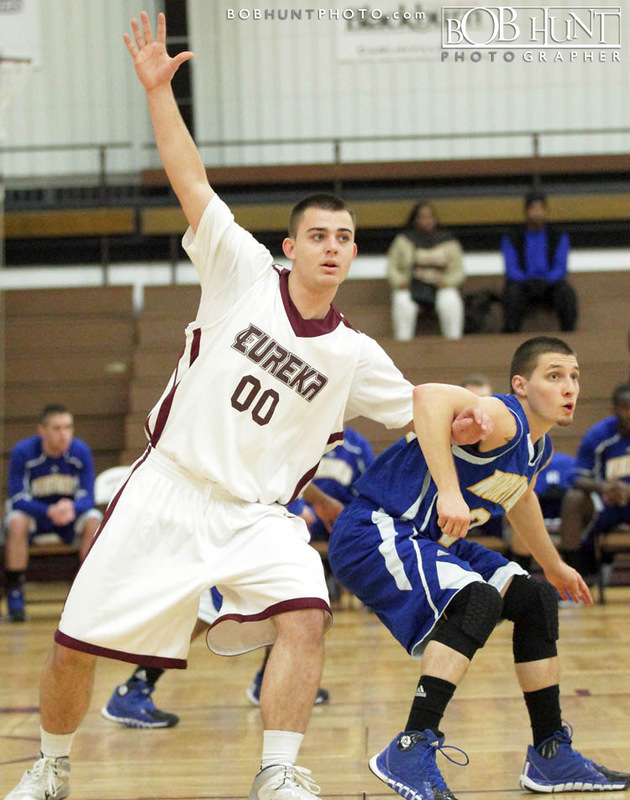 Camden was 4-for-7 from 3-point range. 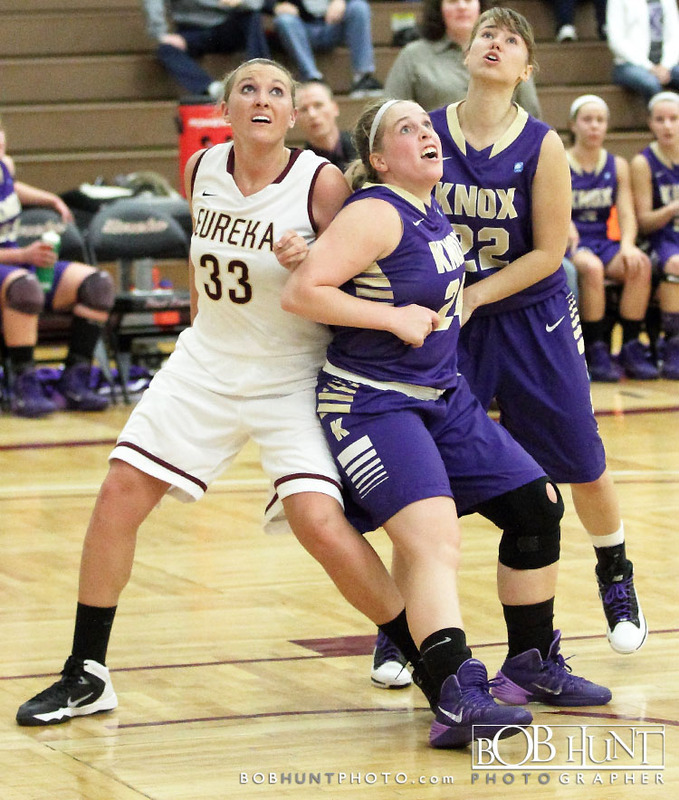 Junior forward Kelsey Shoemake added 13 points, eight boards and two blocked shots. 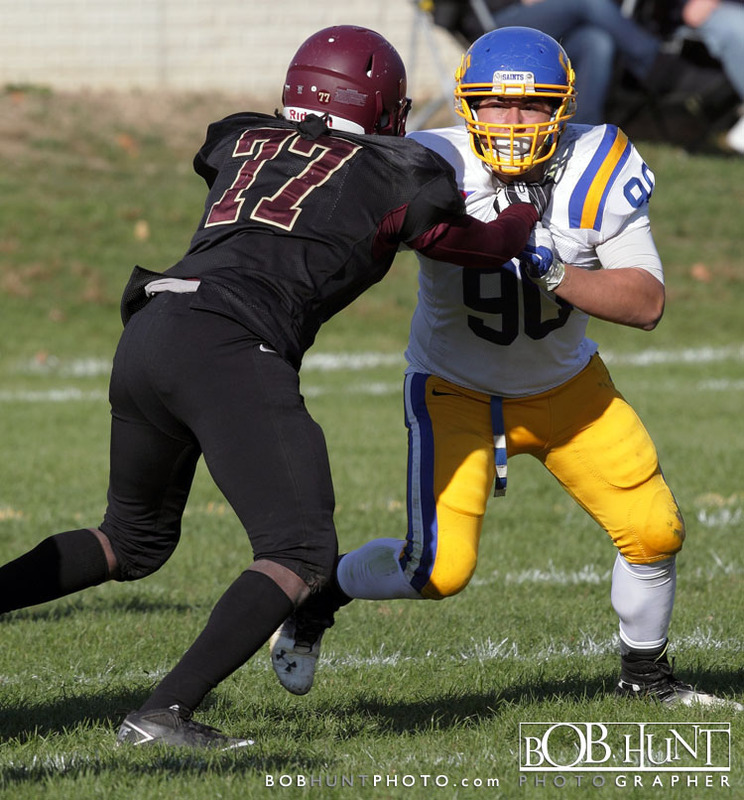 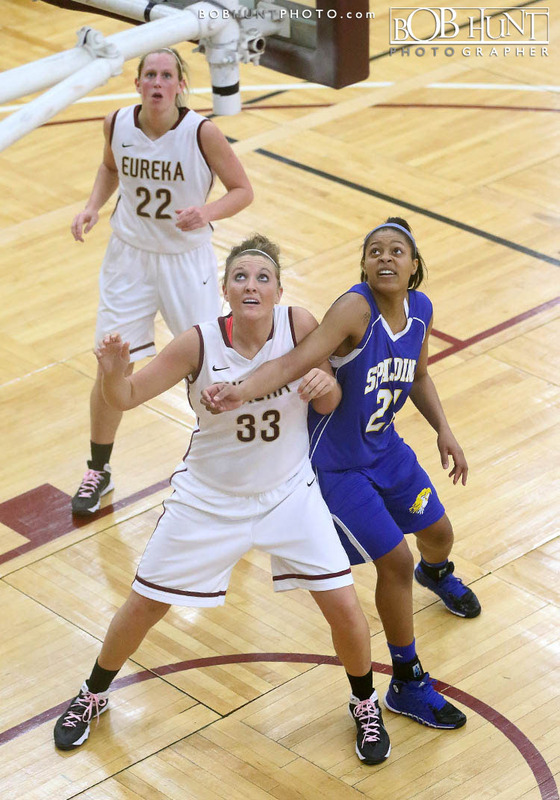 Saturday’s defeat ended Eureka’s eight-game home win streak that dated back to November. 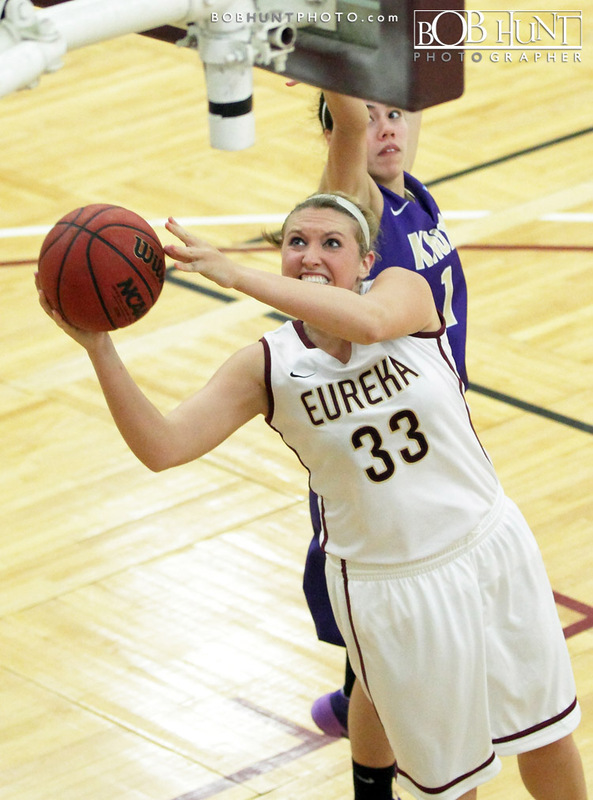 The Red Devils will return to the road Wednesday for a 6 p.m. SLIAC tip-off at MacMurray in Jacksonville, Ill.
Eureka College senior guard Caty Eeten scored 23 points, including a driving layup with 9:19 left in the second half to break the all-time Eureka scoring record, lifting the Red Devils to a 97-76 non-conference win over Knox College, Saturday afternoon at the Reagan Center. 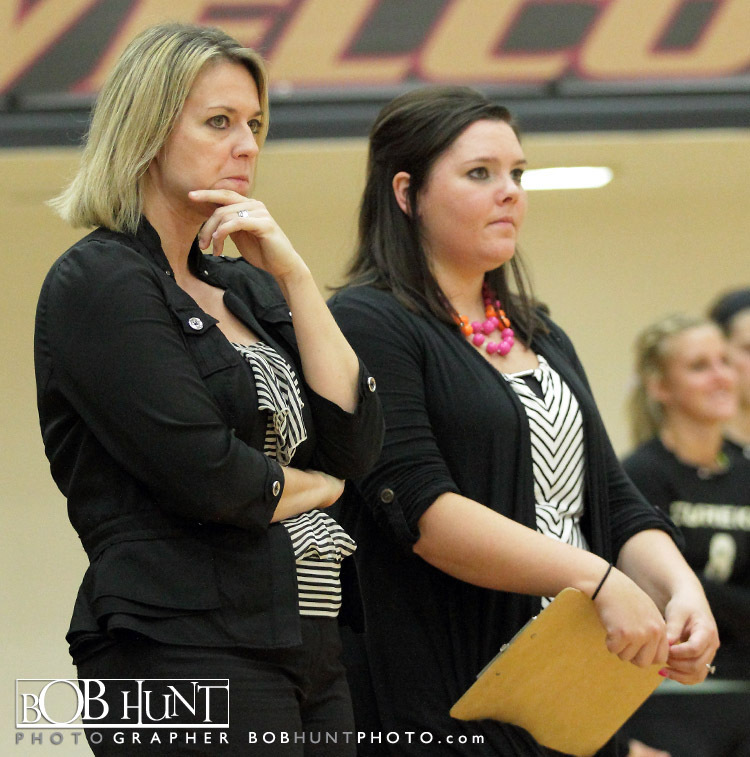 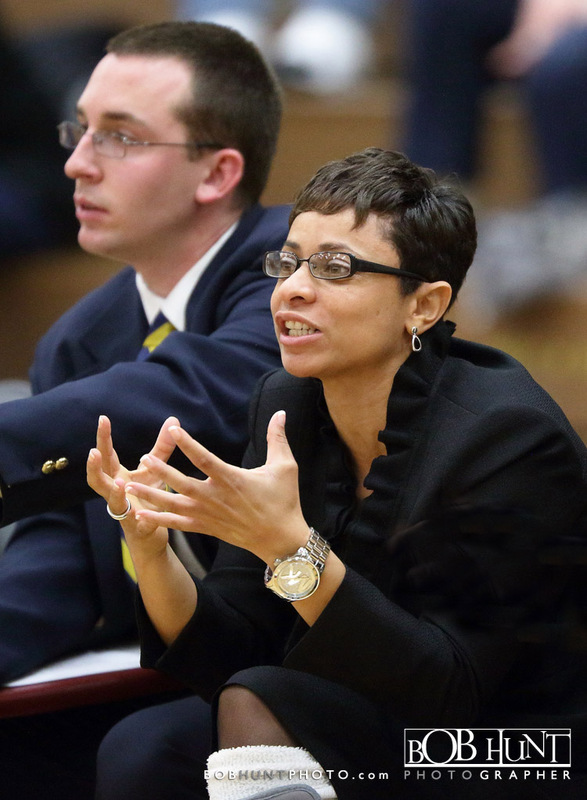 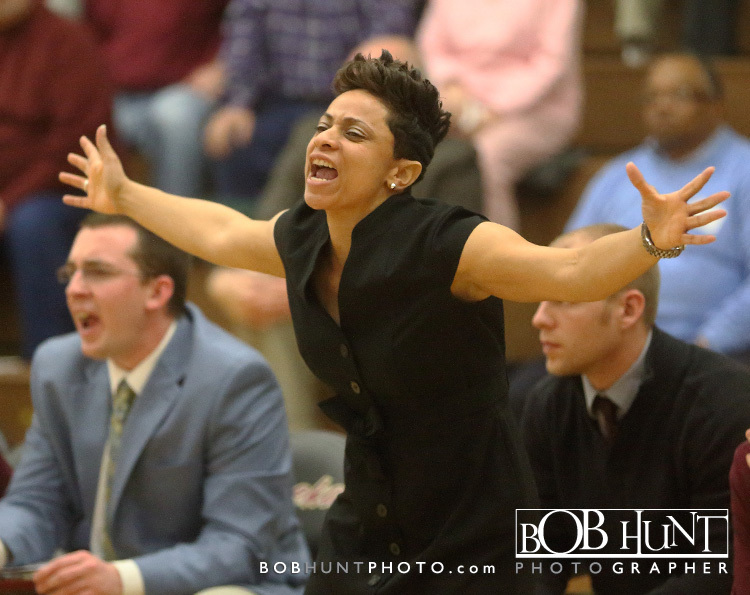 The decision also marked the first home victory for new head coach Victoria Jones. 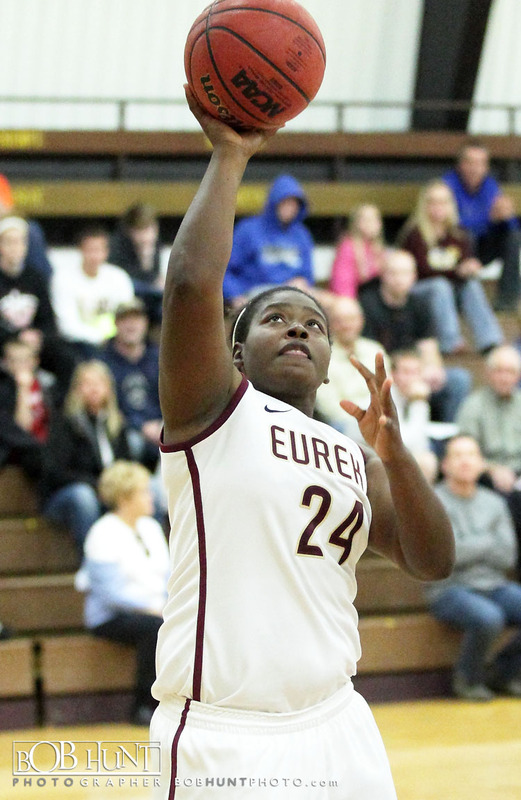 Eeten overcame early foul trouble and went 10-for-16 for the field to finish the contest with 1,485 points, breaking the previous EC record of 1,483 set by Jessica Reardon (2001-05). 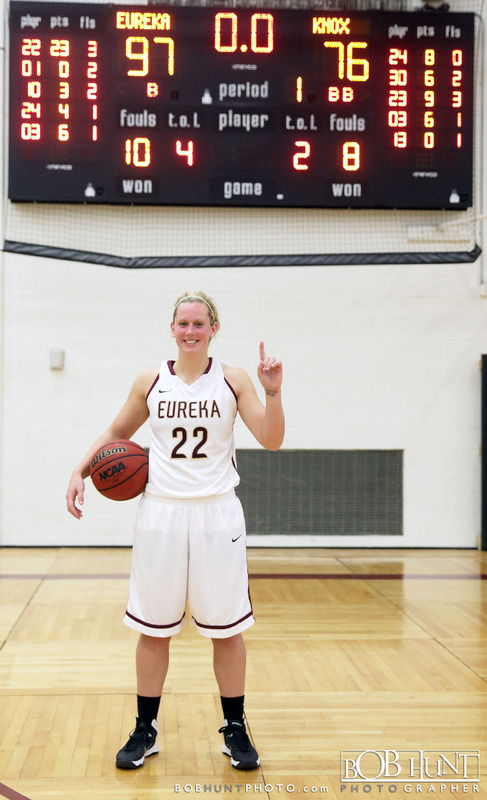 Eeten, who set the new all-time mark in only 71 career appearances, also owns all-time program records in scoring average (20.9), free throws made (466) and free throws attempted (575). 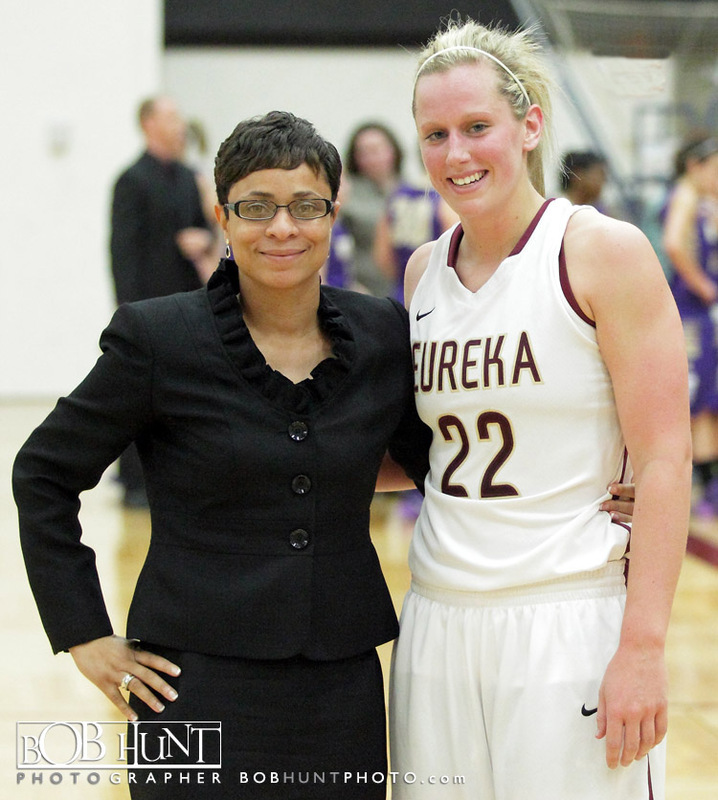 She also has made 481 career field goals, 103 shy of the all-time Eureka record of 584 set by Jill McGinnis (1991-95). 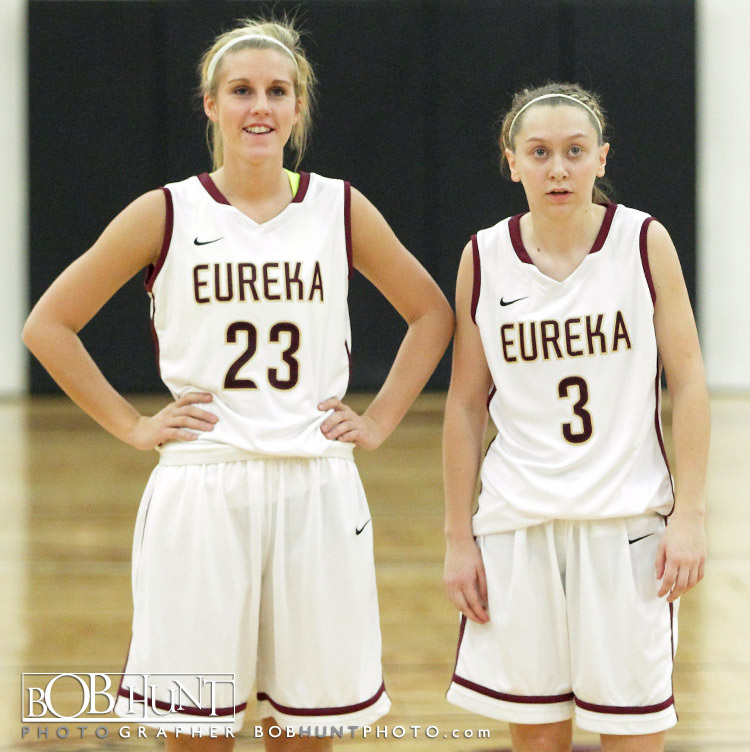 Saturday’s game was played at the Prairie Fire’s brisk tempo that includes full-court pressure and frequent mass substitutions. 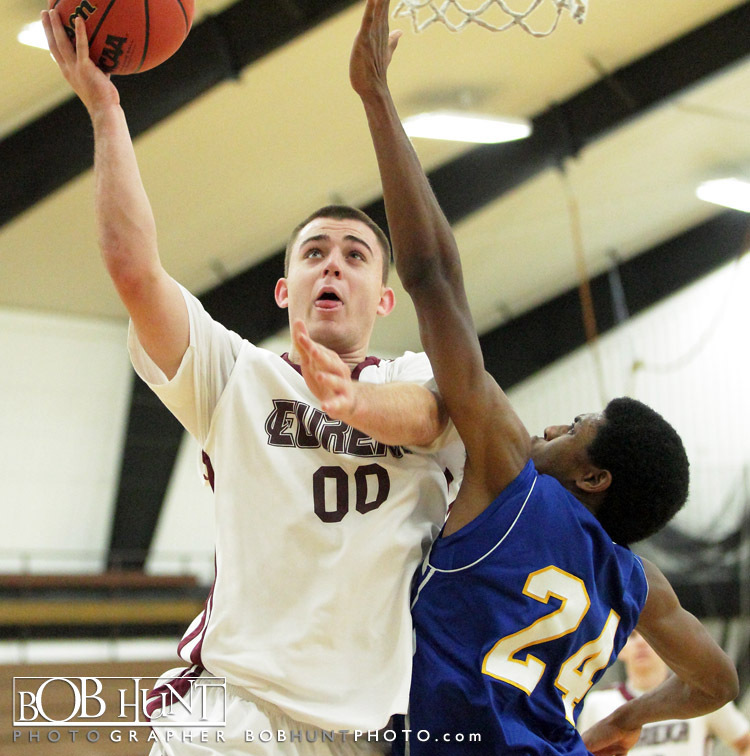 The visitors quickly claimed their largest lead of the afternoon, 10-4, less than five minutes into the contest. 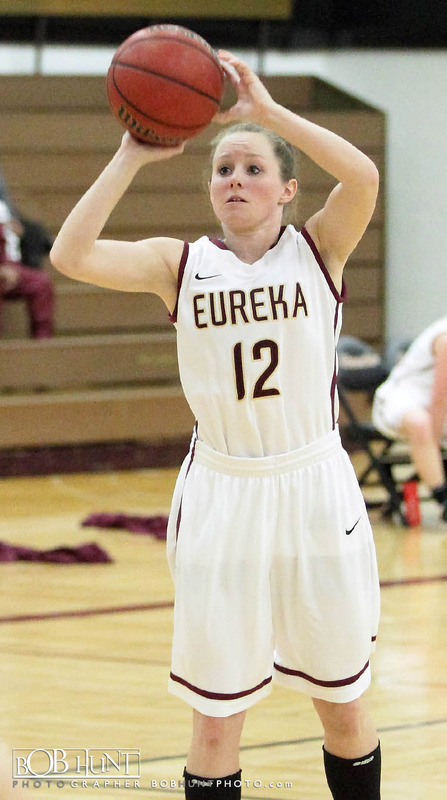 The Red Devils recovered quickly, responding with a 11-4 run and snagging their first lead of the day when junior forward Kelsey Shoemake scored in transition for a 15-14 edge with 12:52 left in the first half. 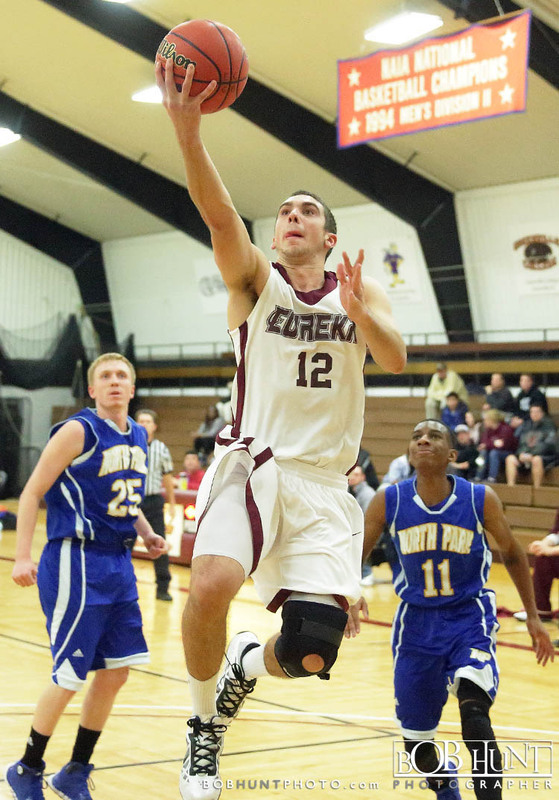 Eureka College junior guard Seth Wickert erupted for 30 points and six rebounds and senior guard Connor Lincoln tacked on a career-high 16 points in his fourth career start, but a 3-point play from North Park‘s Juwan Henry with 1:09 remaining helped the Vikings rally for an 87-83 non-conference victory over the Red Devils, Tuesday night at the Reagan Center. 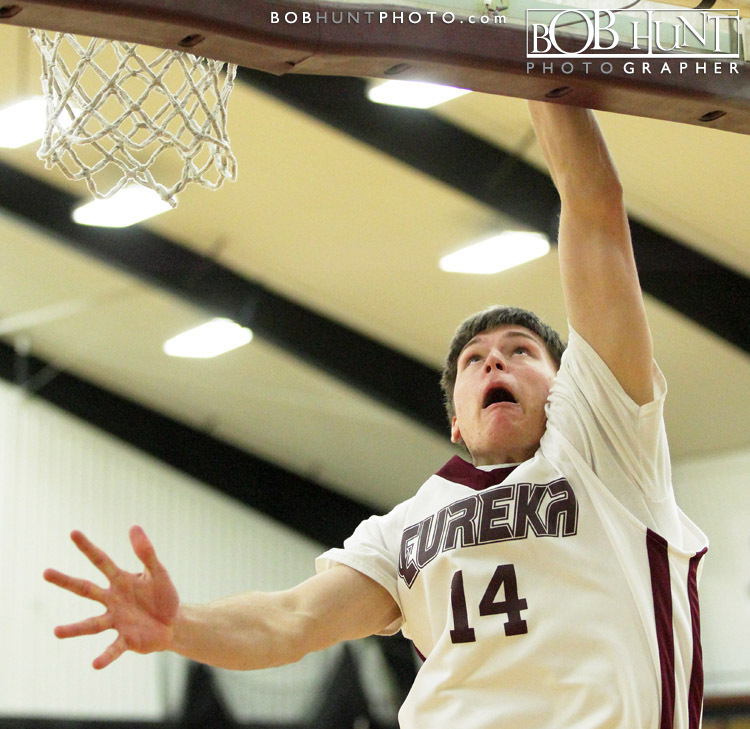 The decision snapped Eureka’s 9-game home win streak. 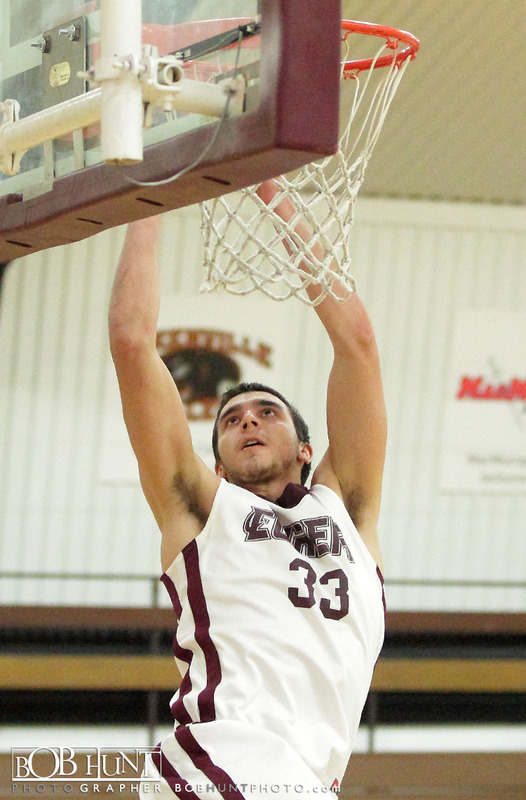 The Vikings led for a large portion of the first half and eventually opened up their largest lead of the night when Ryan Hyrn connected on a 3-point try for a 21-16 lead with 10:49 left in the half. 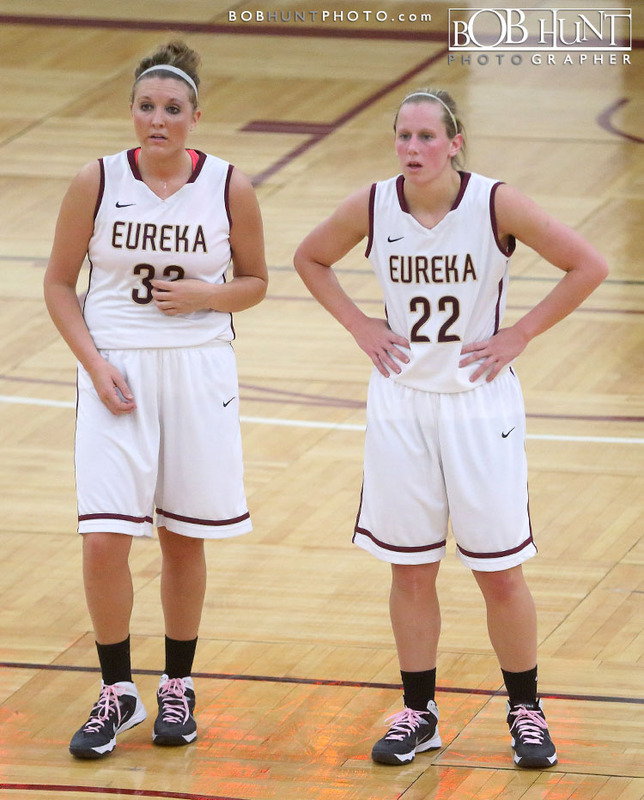 Eureka answered the early deficit, ripping off 12 unanswered points to spark a 19-4 run over the next 6:24. 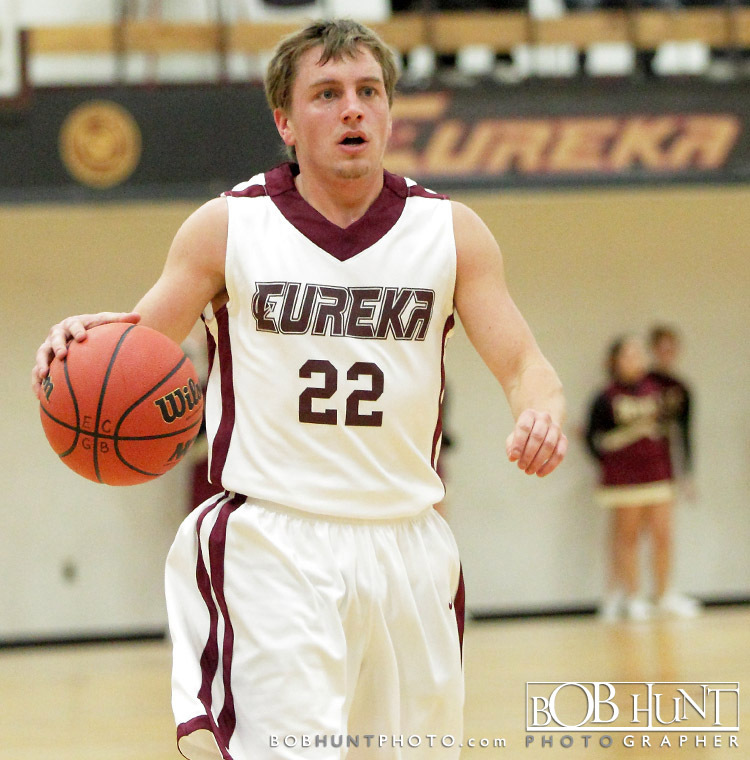 Wickert scored 13 of his 30 points during the surge, including a pair of free throws with 9:01 remaining in the half for Eureka’s first lead of the night at 22-21. 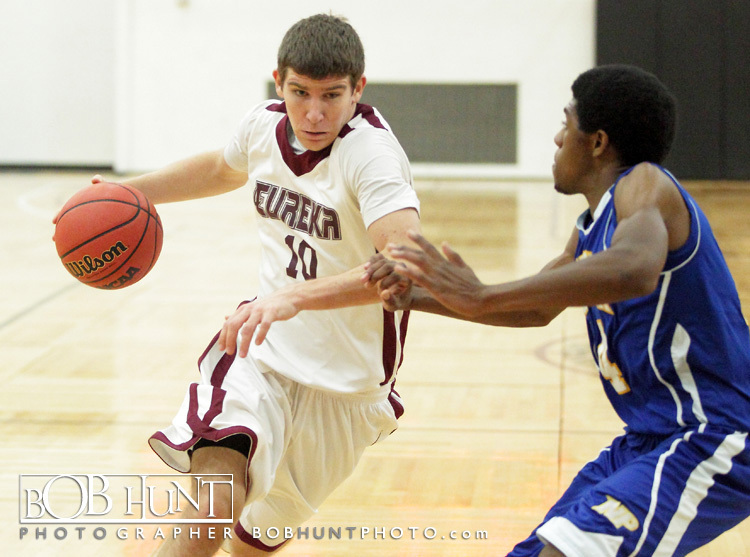 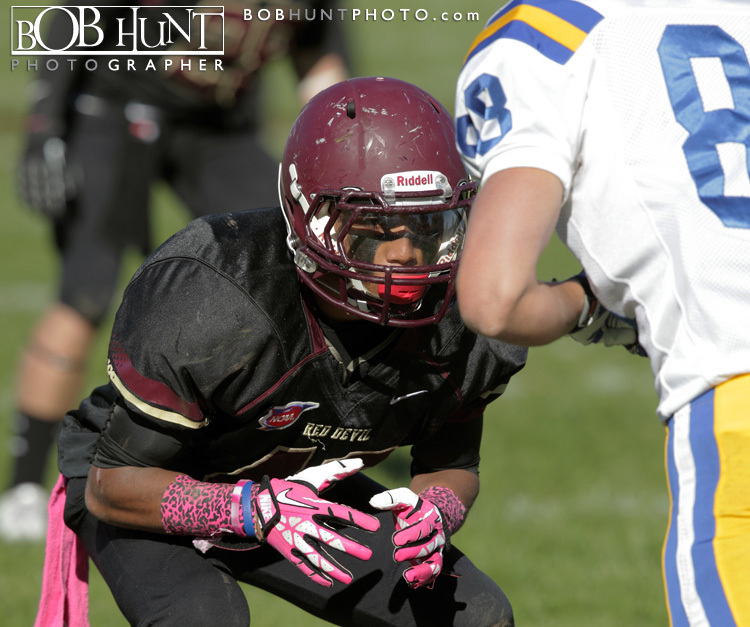 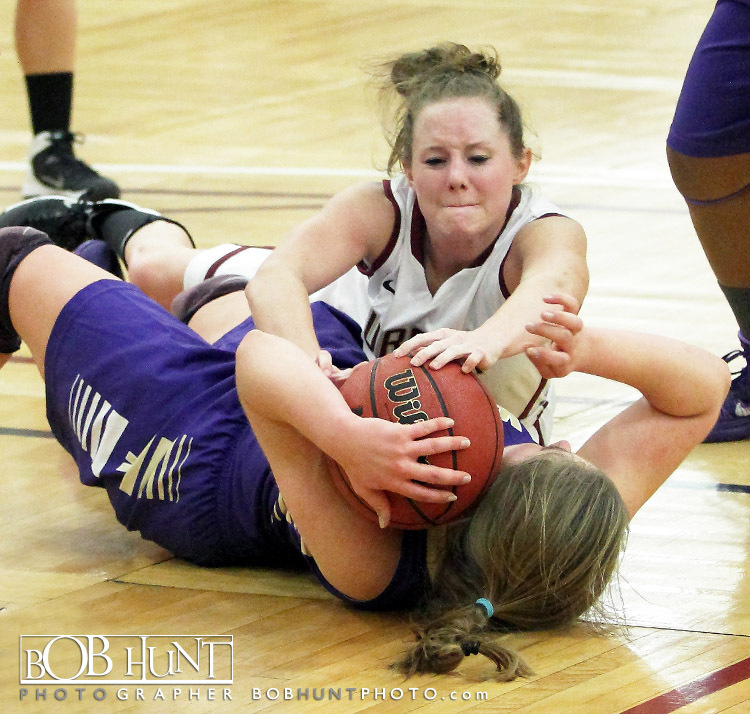 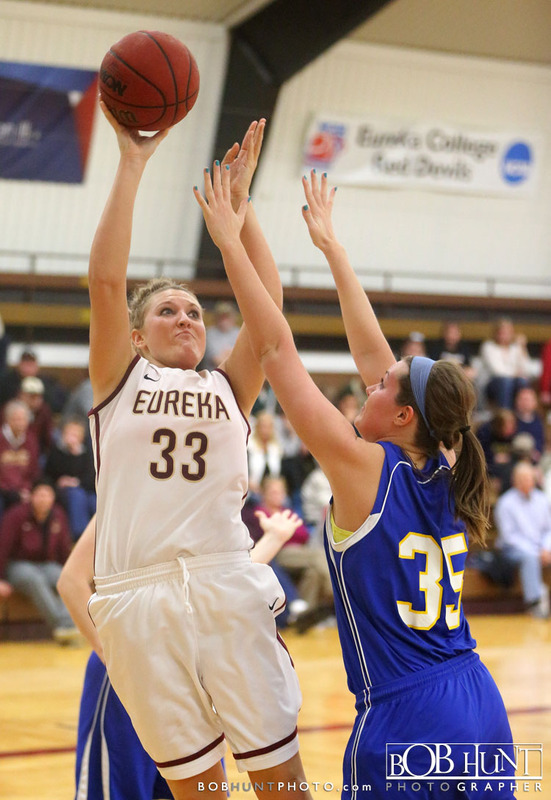 Eureka ultimately held a 35-25 cushion, its biggest lead of the game. 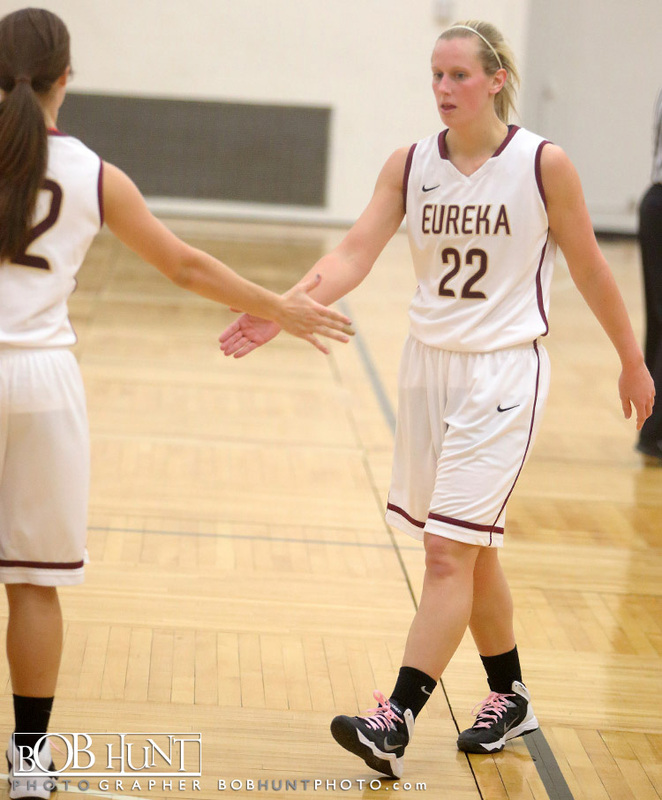 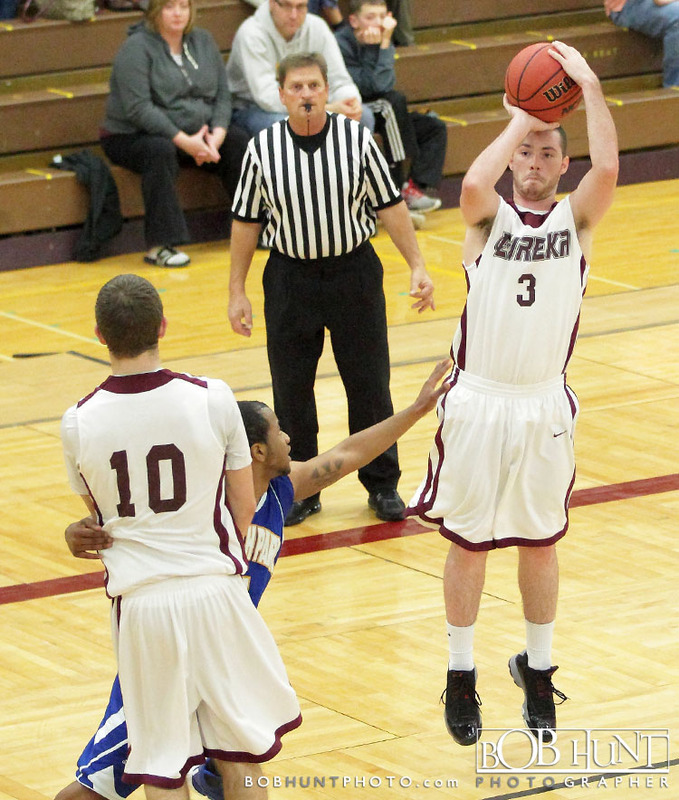 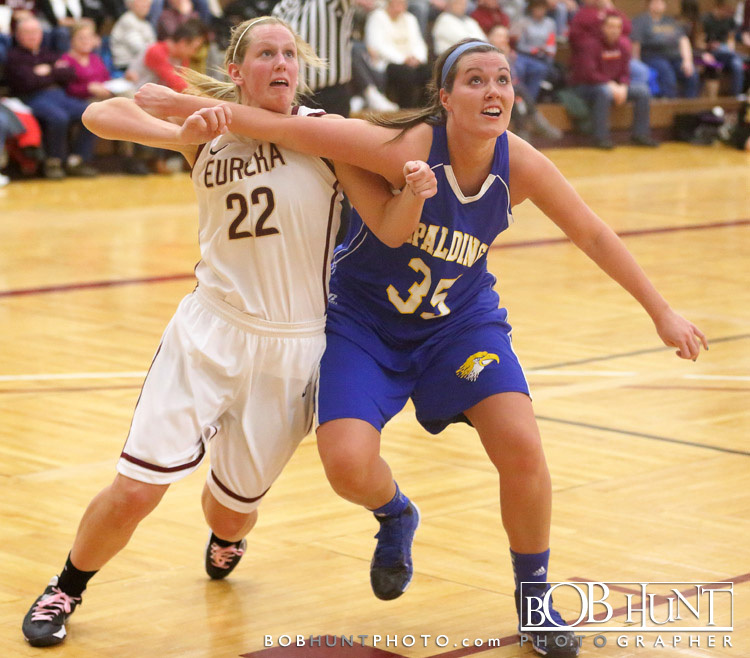 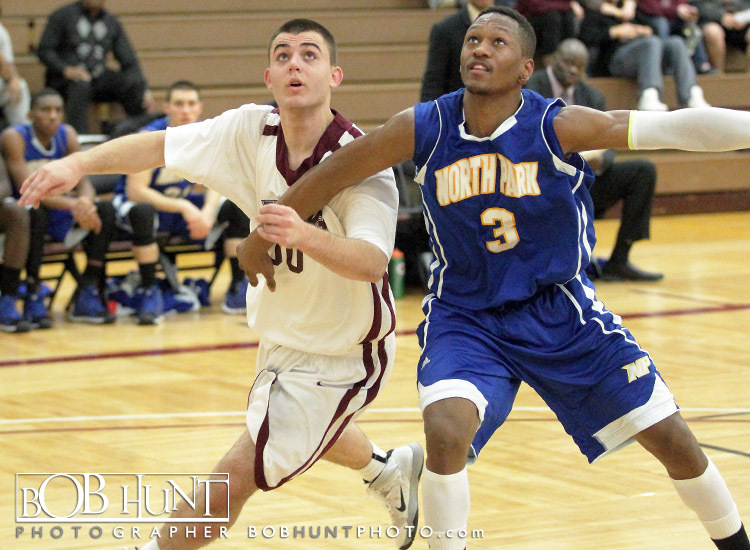 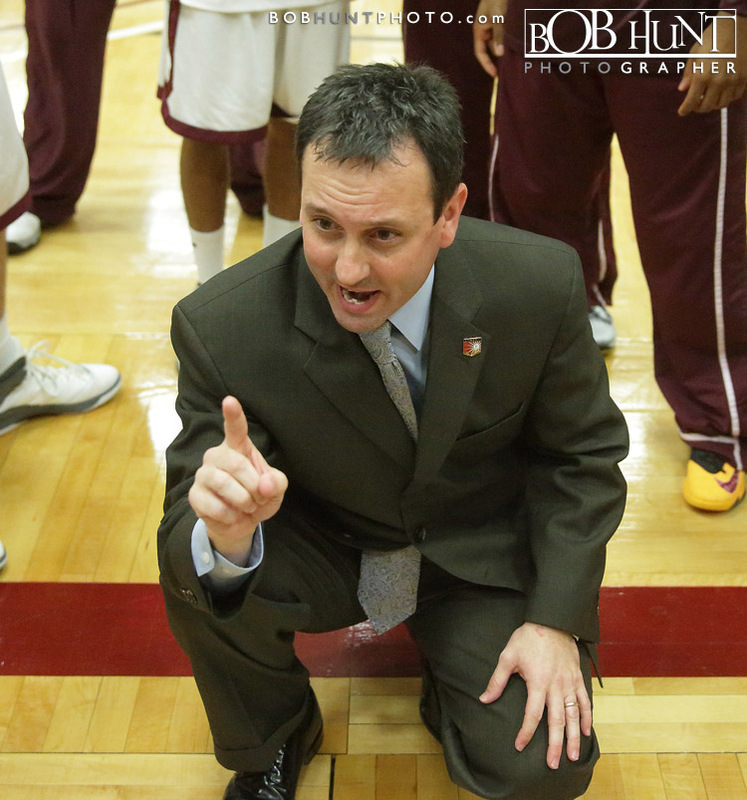 Eureka shot a season-high 51 percent (28-for-55) as a team and held a 33-22 edge on the glass. 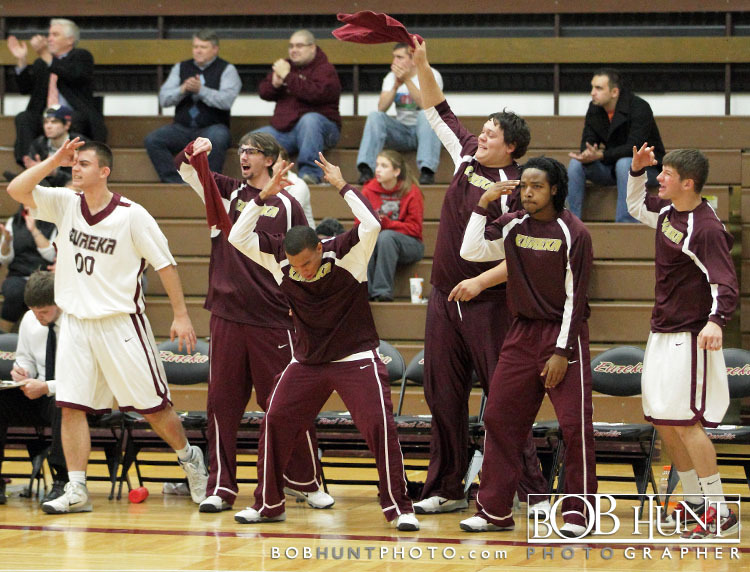 The defeat ended a 9-game home win streak that dated back to December of last season. 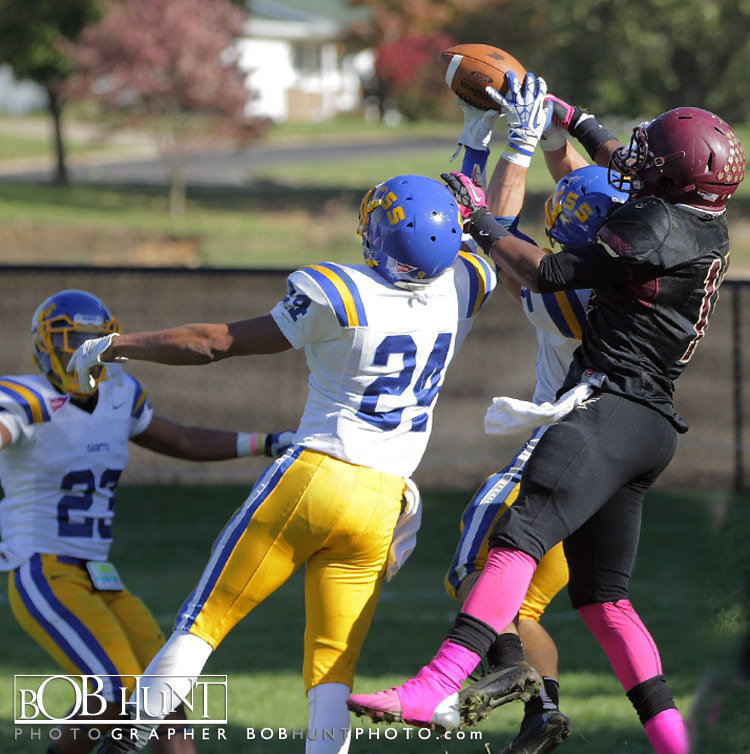 Eureka College junior quarterback Blake Robles completed passes to 10 different receivers and set or matched career-highs with 25 completions, 345 yards and four touchdowns, but Upper Midwest Athletic Conference co-leader St. Scholastica scored on four of its first five possessions to build an early lead and later held off a second-half rally from the hosts in a 38-25 league victory over the Red Devils, Saturday afternoon at Pete FioRito Stadium at McKinzie Field. 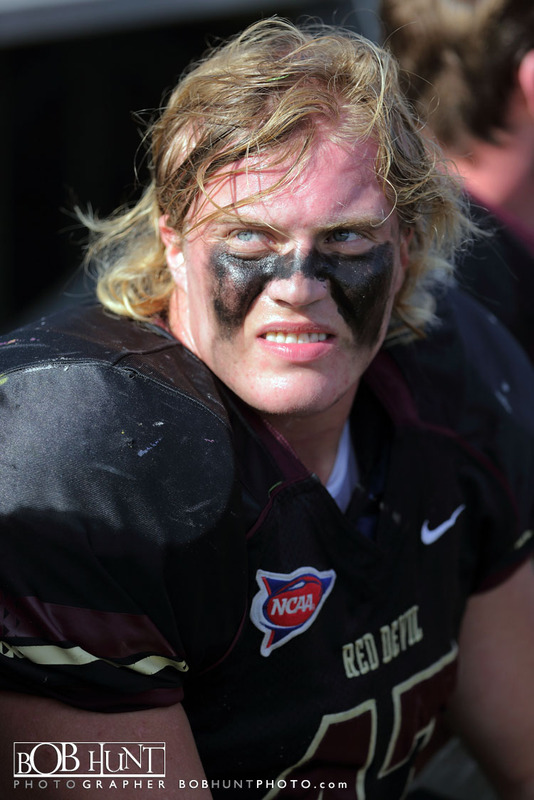 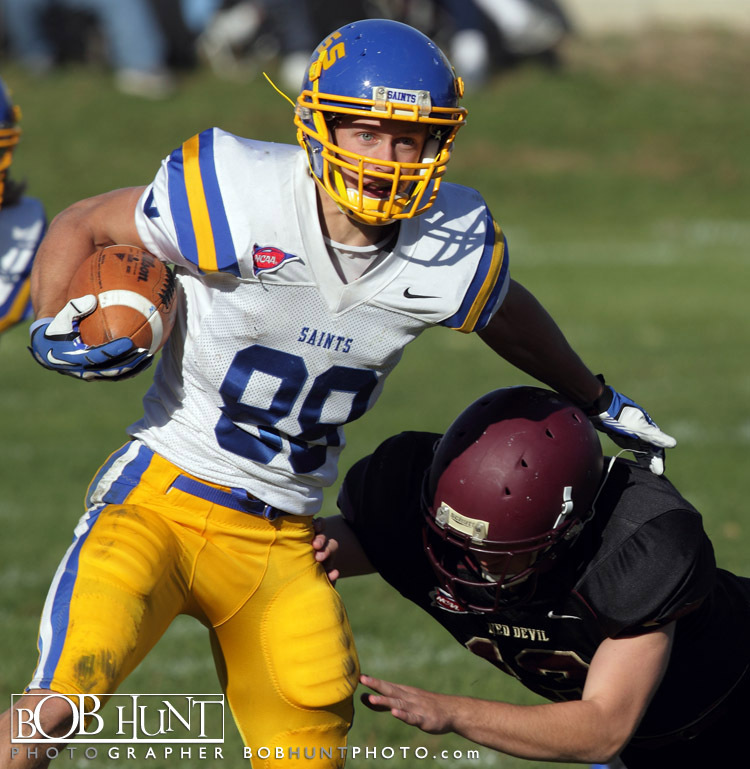 The Saints put the Red Devils in a hole early, grabbing a 24-0 advantage before the EC offense could get into a rhythm. 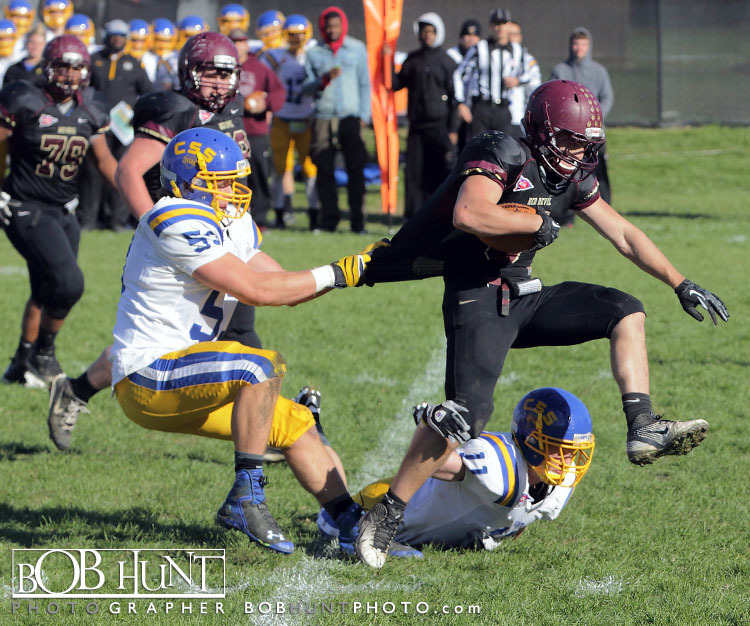 An 11-yard touchdown rush from Jake Jensen capped the first CSS possession and got the visitors on the board with a 7-0 lead. 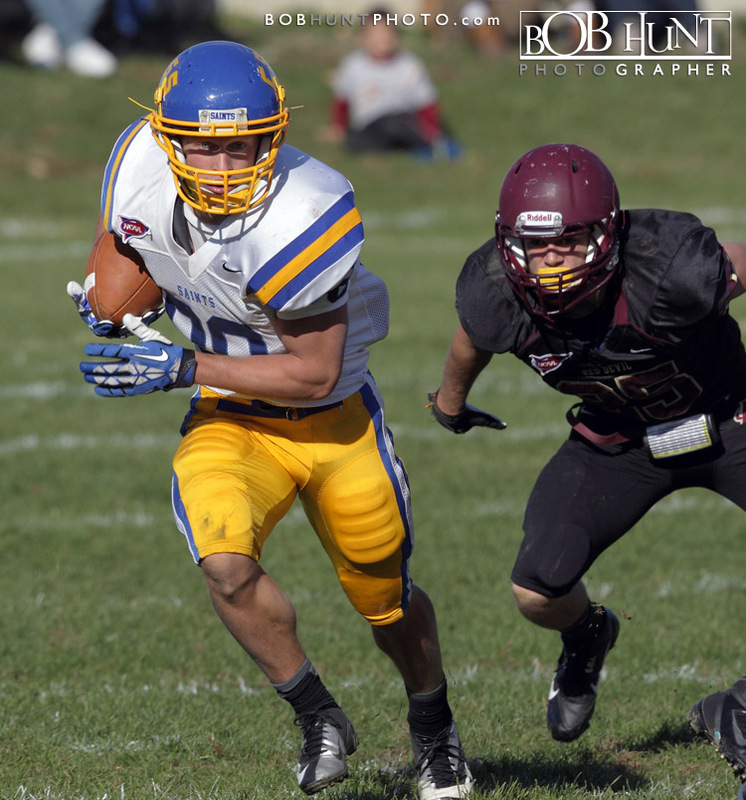 The Saints got the ball back after a Eureka three-and-out and stretched their lead to 14-0 when quarterback Tyler Harper connected with Spencer Sprecht with a 4-yard touchdown pass with 3:29 left in the first. 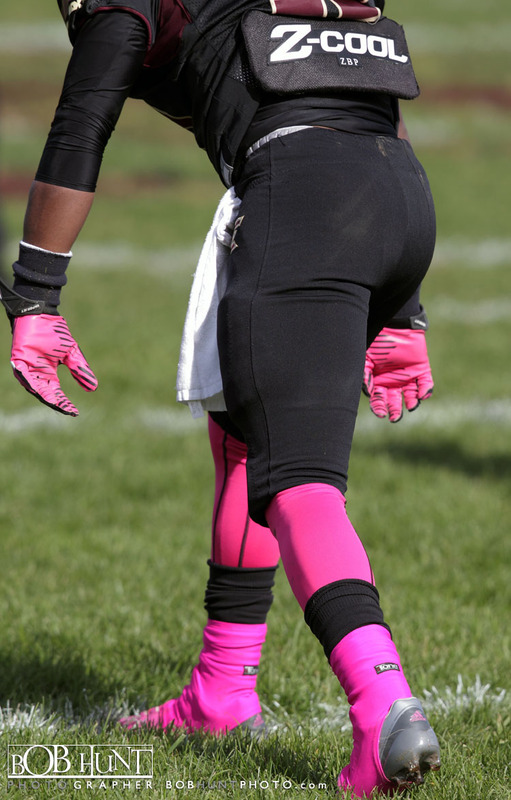 The Saints racked up 144 yards of offense in the first quarter and led 14-0 at the end of the frame. 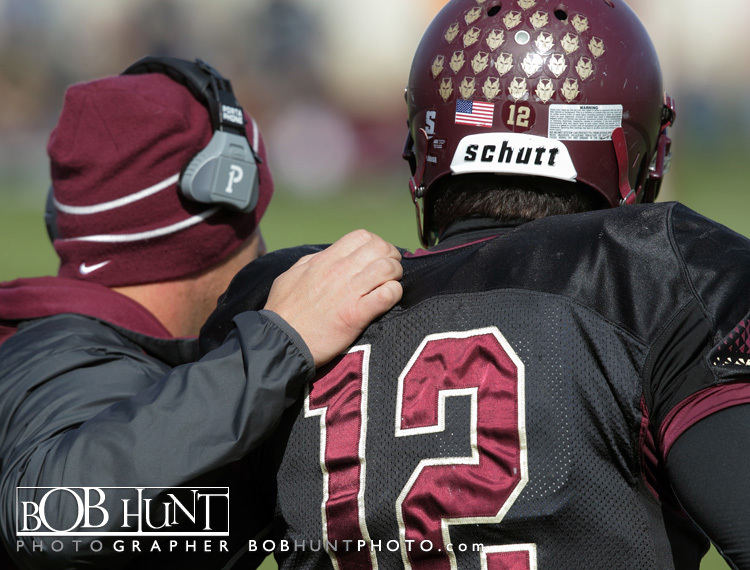 Robles finished the day 25-for-47 for a career-high 345 yards and four touchdowns. 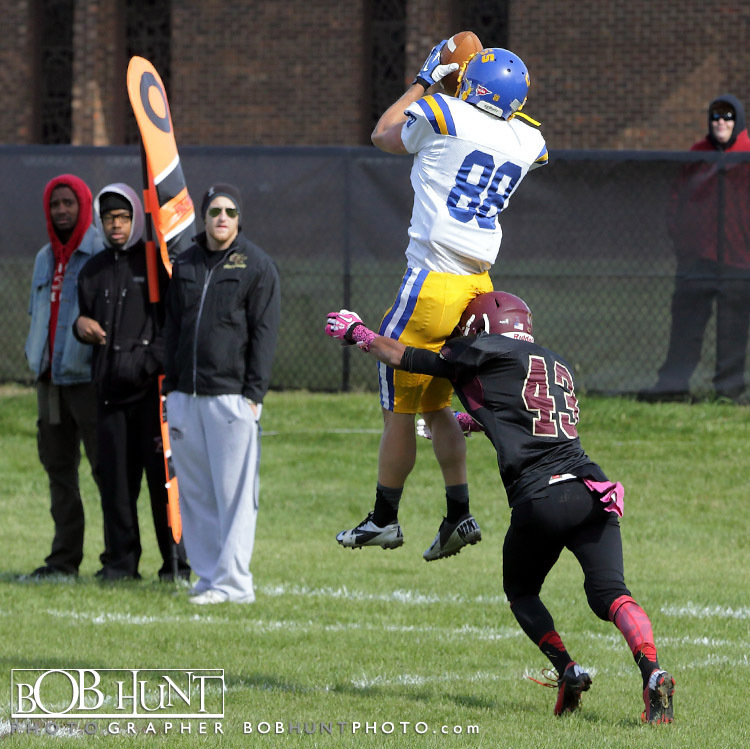 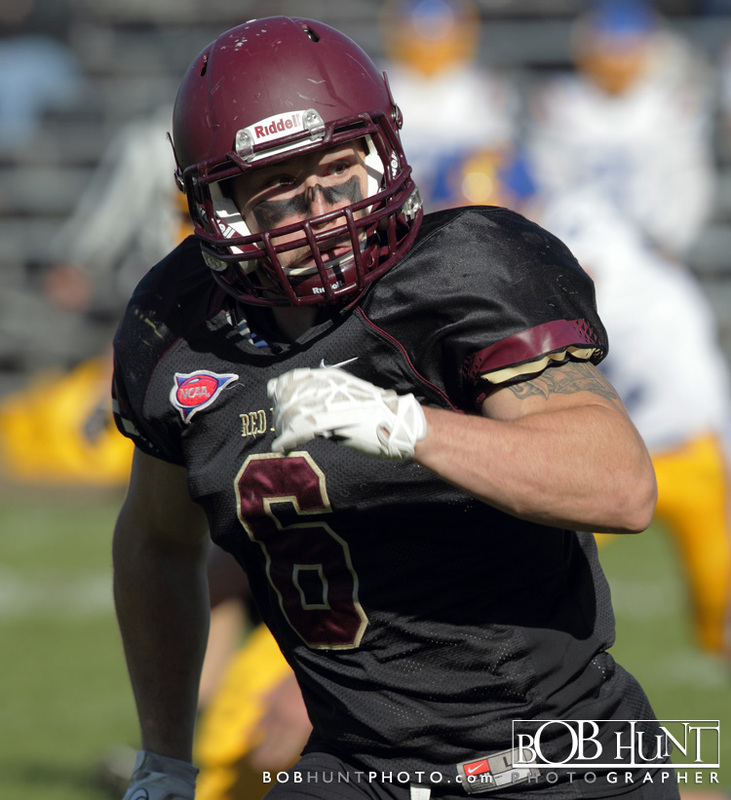 Jake Bane made a season-high six catches for 70 yards and two scores, while freshman receiver Dorell Baugh made four receptions for 29 yards. 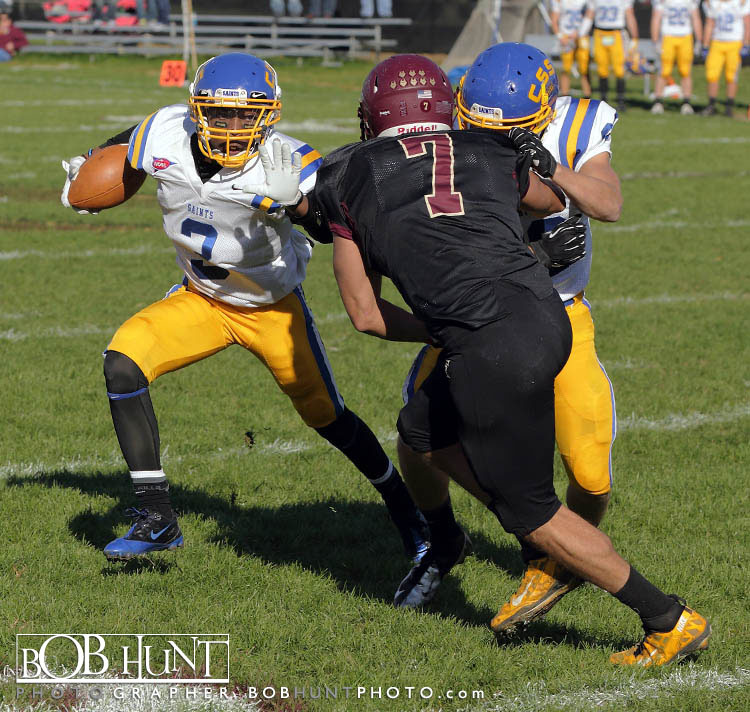 Senior running back Corey Dawson rushed 14 times for 57 yards. 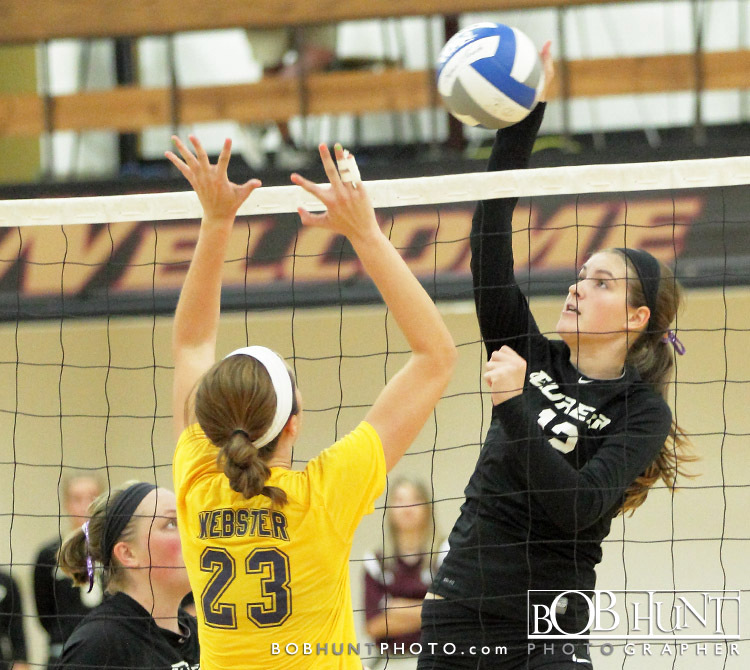 Two-time defending St. Louis Intercollegiate Athletic Conference champion Webster got a match-high nine kills from Sam Kersting and committed only nine errors as a team for a .295 hitting percentage to earn a 25-19, 25-8, 25-13 league victory over the Eureka College volleyball team, Friday night at the Reagan Center. 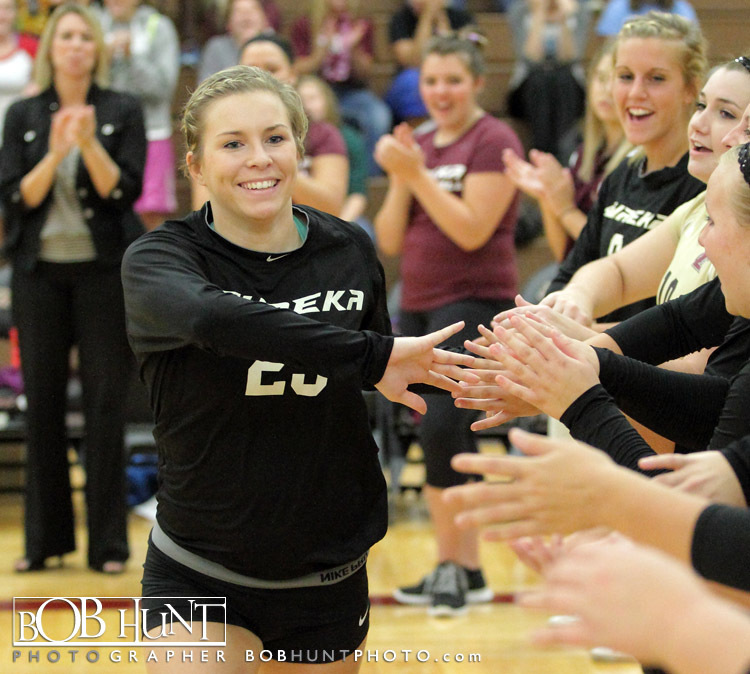 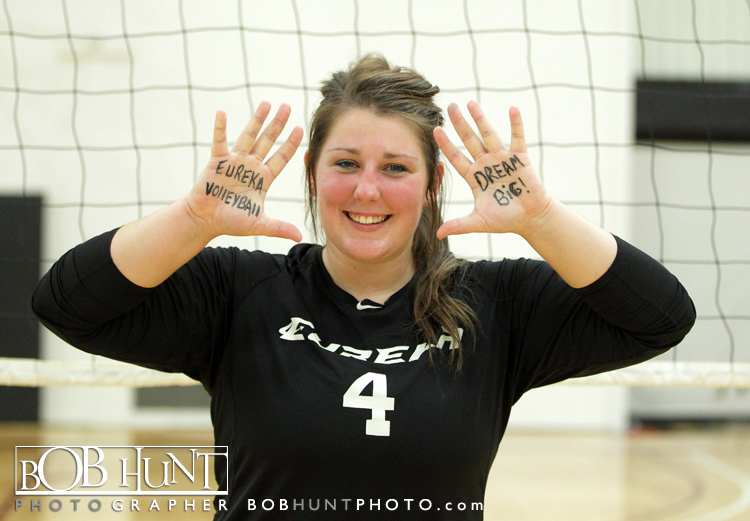 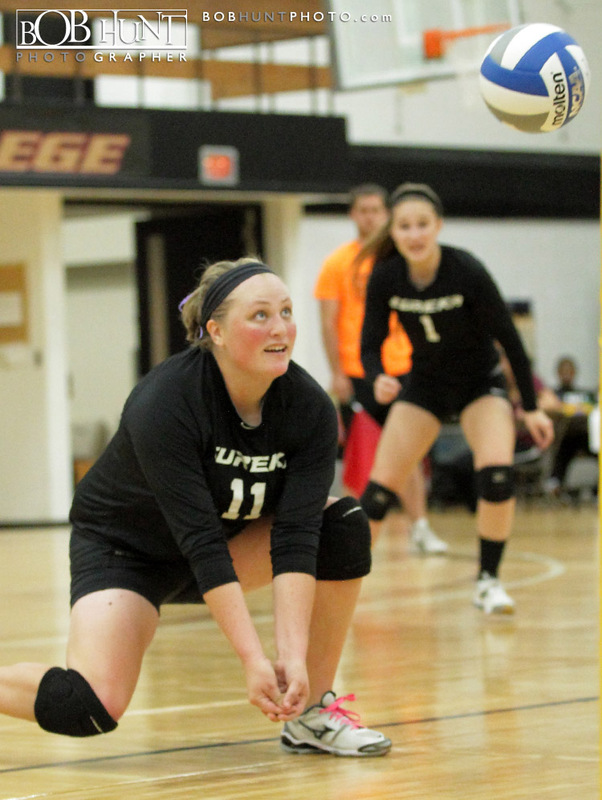 Eureka (0-8, 0-3 SLIAC) senior Kelli Dunne and junior Kelsey Shoemake shared the team lead with six kills apiece. 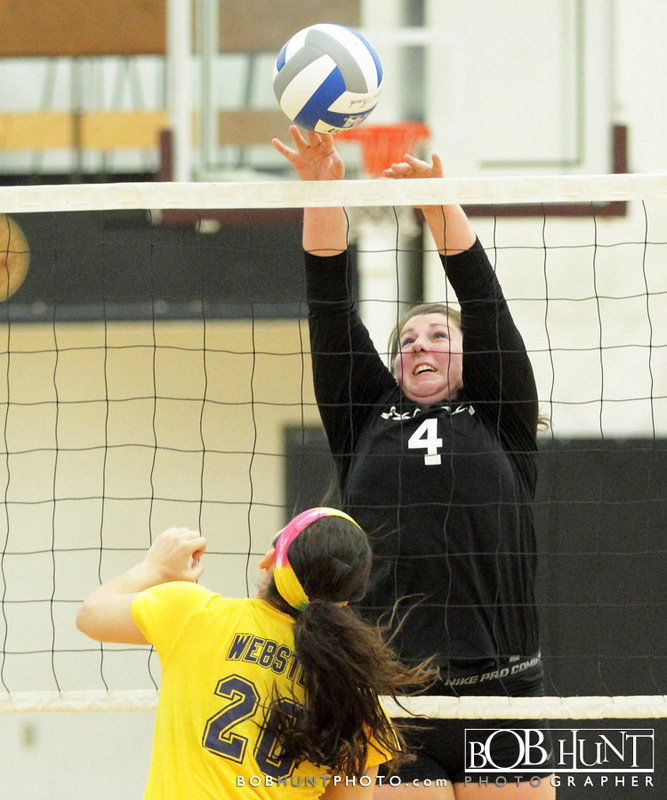 The Red Devils had 19 kills as a team. 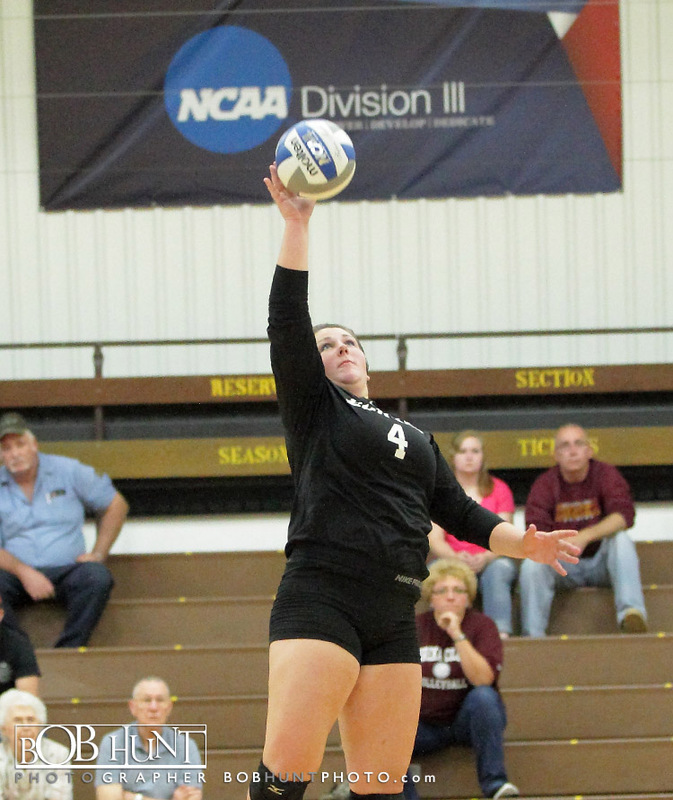 Senior setter Emily Campbell collected all 17 of the Red Devils’ assist and added 10 digs for her second consecutive double-double and her third double-double of the season. 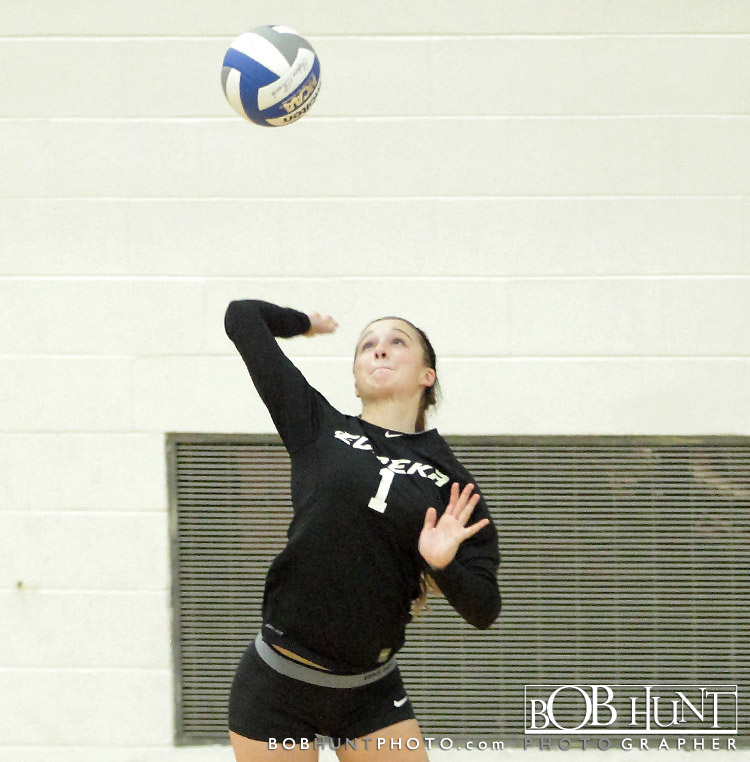 Freshman Arianna Young led EC defensively with 12 digs, while classmate Molly Jugovic had two block solos and two block assists.